- The Era of Corporate Profit - corporate profits (after tax) are the highest in the last 50 years, while wage income is at its lowest over the same period (both as shares of GDP). And (surprise, surprise!) corporate taxes are way down. - A former conservative asks When Did the GOP Lose Touch With Reality? - The Tuesday Birthday Problem is a long article about a tricky probability question. (the answer depends on how you ask it) I like probability questions, but I tend to steer clear of not-entirely-well-formed ones like this one. - Submit it on the Amazon Appstore - the terms aren't great, but the more exposure, the better. 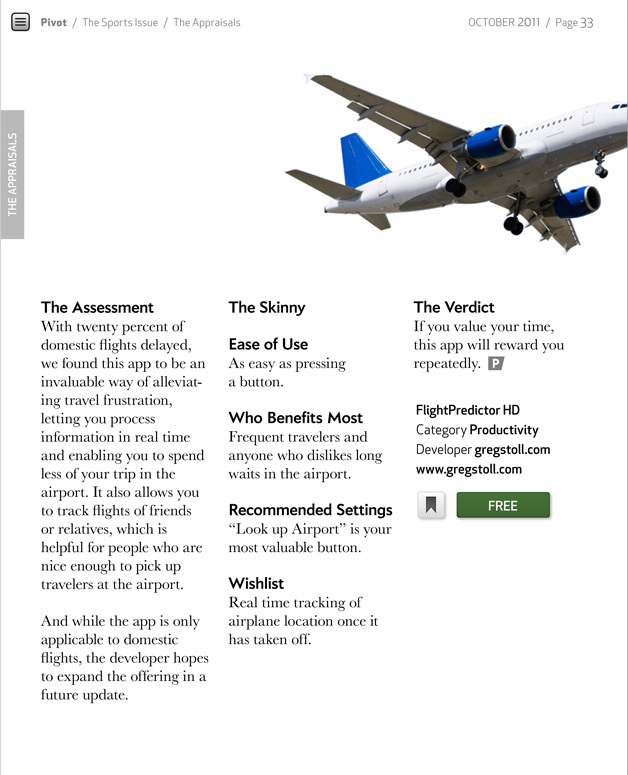 The app makes much more sense to me on smartphones than it does on tablets, but it's sold pretty well on the TouchPad so I want to give it a chance on the Kindle Fire. It's currently going through the approval process and will be available...well, at some point. 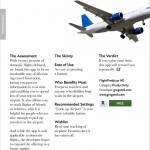 - Free version: Last night I finished up FlightPredictor Lite, a free version with ads and a limit of 6 flights to add. Hopefully this will give people the confidence to upgrade to the real one. Probably going to move on to Windows Phone stuff soon, modulo holiday goings-on. The supercommittee failed to reach a deal on reducing the deficit. Reports are that the Democrats on the committee offered the Republicans a "fair deal" roughly in line with the Bowles-Simpson bipartisan deficit reduction plan. They agreed to cut entitlements, but the Republicans refused to raise taxes. Remember this the next time you hear about "fiscal responsibility" and such. The latest xkcd is a cool graph of money. I wish I had a wall at work to put a poster of that or Death and Taxes on. Budgets are fun! HP had their conference call and remarked that they've lost $3.3 billion on webOS this year...considering they also paid $1.2 billion to buy it in the first place, that starts to add up. I can understand why they might be hesitant to continue with it. It sounds like they're planning to make a decision in December, and one sticking point may be getting to license webOS for printers. Sigh. I've seen studies saying that Fox News viewers are less informed, but here's one showing they're less informed than people than people who consume no news! In this month's Atlantic, there was a long and scary article about Pakistan, probably our least friendly "ally". A beautiful five-minute time-lapse video of Earth from the ISS. A new Rick Perry ad is both inaccurate _and_ grammatically incorrect! The story of a last minute trip to St. Louis to try to see Game 7 of the World Series. 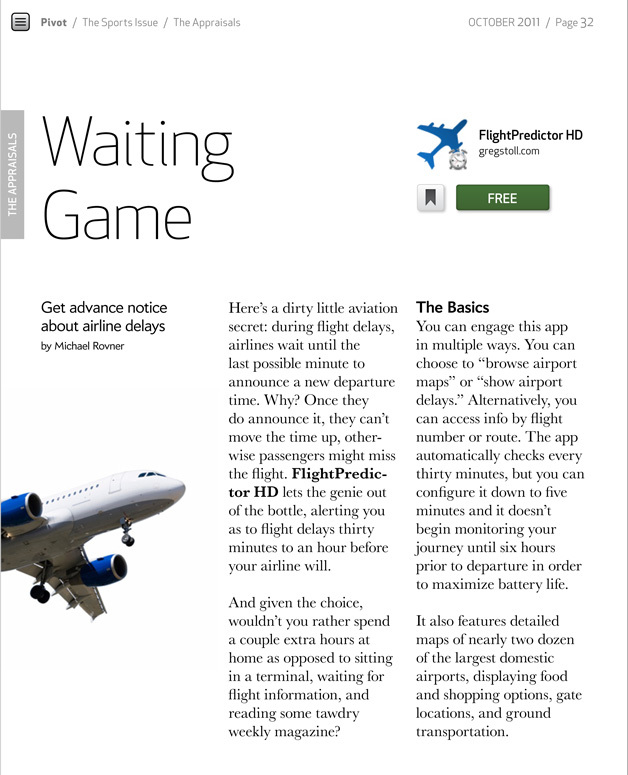 FlightPredictor HD featured in October webOS Pivot magazine! 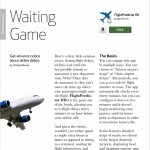 Well, this is a bit bittersweet since the October issue still hasn't been pushed to TouchPad's, but some clever folks at webOSRoundup found it anyway, and FlightPredictor HD is featured! 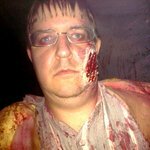 I've posted the thumbnails below - click through for the full pages. Nokia announced the Lumia 800, their new flagship Windows Phone, and it looks pretty sweet. Unfortunately it's not coming to the US until "early next year", but I think I can wait that long. David and I took a mini-vacation this week to New Mexico. Here's all about it! We left Saturday morning and drove through to Carlsbad. The drive was fairly uneventful, except that I had forgotten that the speed limit on I-10 in West Texas is 80! That made things go faster than planned, and made the 55 mph limit on some roads in New Mexico feel ludicrously slow. We arrived in Carlsbad around 6, so we had time to check in to our hotel before heading to dinner. Based on advice in the AAA guidebook, we went to The Flume for dinner, which we never would have done otherwise since it was (we discovered) located in the Best Western down the road. It was nice, though, and we relaxed and shook off the drive while being served by a rookie waiter. After dinner we spent the evening in the hotel room and read and watched TV. For food timing reasons, we decided to stay on Central time (after discovering NM is on Mountain time by seeing the alarm clock in the hotel room!) so we went to bed on the early side. Sunday morning we got up earlyish, checked out of the hotel, and headed to Carlsbad Caverns. The drive down there was slow (darn 55 mph roads for no reason), and we saw mention of "cherry cider" which sounded intriguing. After getting in the park we drove the 7 miles up to the visitor center, stopping at a few sights along the way. Unfortunately, it was pretty clear there had been a recent fire of some sort, as a lot of the vegetation was heavily burned. At the visitor center, we had a bit of time before our Left Hand Tunnel tour started, and we learned about White nose syndrome, which luckily hasn't spread as far west as Carlsbad yet. The tour was neat - there were only 11 of us plus the ranger guide, and we got to carry candle lanterns to light the way. The caverns are very impressive in terms of scope, although in terms of formations we had seen more elaborate ones at Natural Bridge Caverns. After the tour, we went back up to the surface, had lunch, and then went back down to the aptly-named Big Room. It's 1.25 miles around the outside of the cavern, and it's easy to get blown away by the sheer size of everything. The path around the room ends back at the underground visitor center, so we took the elevator back up, did a little souvenir shopping, walked along a nature trail and called it a day after trying a cherry cider. Which tasted good in small amounts. 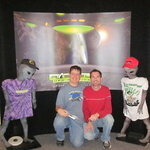 We looked at some gift shops, then went to the very small Walker Aviation Museum at the old base (now the Roswell Airport) where the "alien" debris was brought. Honestly, at this point we were mostly out of things to do in Roswell. We read in a coffeeshop in the local Hastings, and after dinner tried to go bowling but it was a league night. The next morning we had planned to spend the whole day in Roswell, but decided to head back early. We did see two interesting art museums before we left, though. Spent the night in Fort Stockton (after cancelling our last night's reservation at the hotel in Roswell) and then drove back to Austin on Wednesday. All in all it was a quick trip, but we got a lot of reading time in and it was quite relaxing!